We are opening trttNodes to the public, this manual will explain how to use the platform to invest in other coins. All our investments are instant and you will start receiving rewards as soon as you click on “Invest” button. Sign-up on https://node.trittium.cc/ and login with your credentials to the platform. You should see the following dashboard, however, in your case, it will be without transaction history. 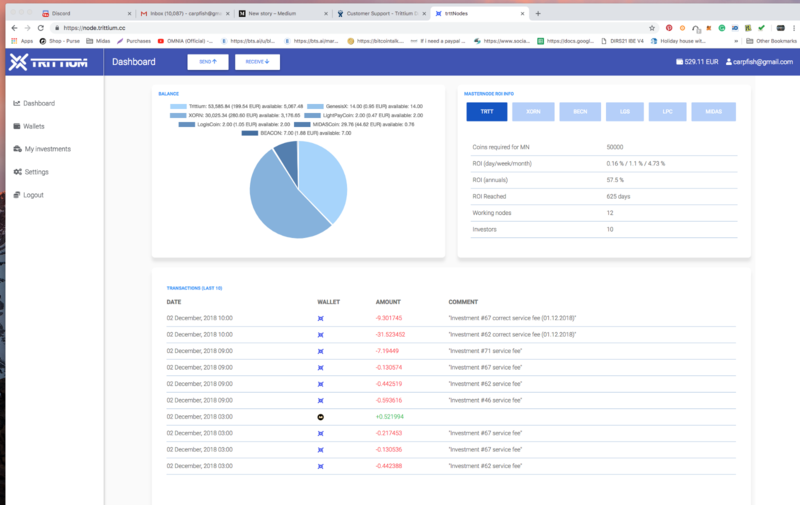 Coins listed on trttNodes and available for investment are located in the upper right corner - Trittium, Xorn, BCN, LGS, LPC, Midas, XGS, BEACON, INGY, Dash Green, RCRT, RUPX, BND, THC, NZL, ROCO, QUOT, LRM, EVOS, ESBC, GIC, ABET, PCR, WGR, MCPC, SINS, PEG, and CATO. * these are the coins listed by the time when this article was written. Collect the amount of coins that you like to invest on trttNodes. You can purchase coins of desired cryptocurrency on exchange or send them from your wallet if you already hold some amounts. 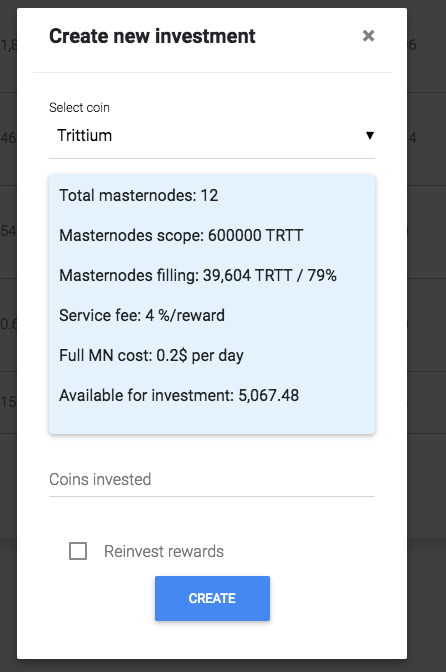 Don’t forget to to buy some Trittium coins as the fees are paid in $TRTT. You can buy Trittium on CryptoBridge - here or Coinexchange - here . Now you can deposit your coins to your trttNodes wallet of a particular cryptocurrency. 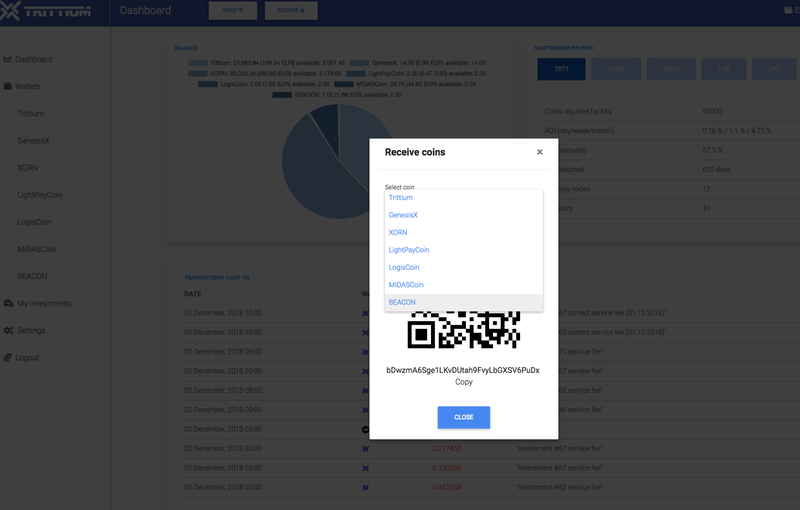 Click on the “Receive” button located on the top of the screen in the platform header, then choose the desired coin, copy or scan the generated receiving address and send coins to it from exchange or your wallet of same cryptocurrency. Once you get 6 confirmations for your deposit transaction, your balance will be eligible for investment. Navigate to “My investments” from navigation on the left and press the button “Invest” to place new investment. A pop-up window will show up on your screen with an investment details. Select a coin of your investment from the drop-down menu on the top of the form, the amount of your investment, place a thick in the “Reinvest rewards” checkbox if you want to reinvest rewards and then press the button “Create”. Remember that create an investment moves the coins to a different address, so try to invest 1 coin less than your balance to pay network fee. YOU ARE AWESOME! YOUR INVESTMENT IS NOW ACTIVE AND YOU WILL SOON GET YOUR FIRST REWARD. ENJOY EARNING WITH trttNodes! And don't forget to clap!!!! !